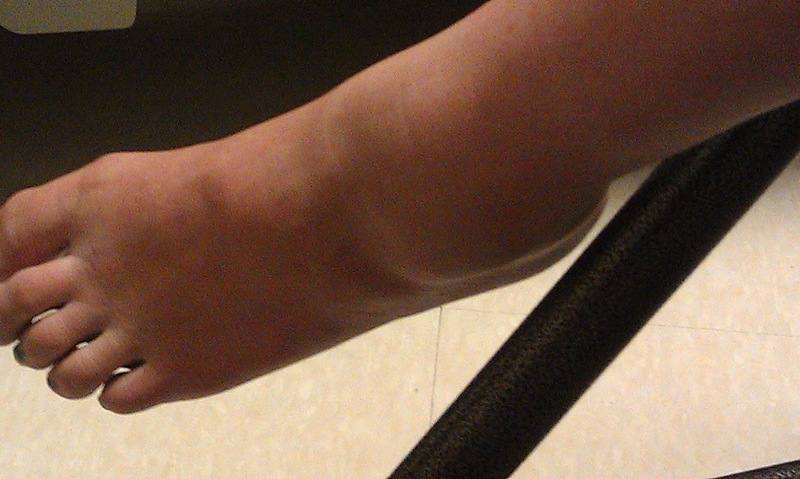 My daughter recently fell getting off the bus and sprained her ankle. Many diagnosed with autism have a high tolerance to pain. She rarely cries and this fall was a tear jerker for her. I knew it was bad when I saw the tears falling quietly and it swelled up to a goose egg. I took a photo to send her father when he asked how bad it was. I am not a nurse so I figured a trip to ER would be best treatment. 7 x-rays later it was determined it was a #2 sprain. Not the worst and certainly will heal in time thankfully. Meanwhile, the crutches are not the easiest. Because she is on the spectrum, it makes using crutches very interesting. Like how to space the crutches without doing a face plant, how to maneuver around objects without crashing into them, and most importantly, how to remain a tip toe walker with two sticks and one injured foot not cooperating? Good times in my household and at school. The shining aspect, she has friends carrying her backpack for her which encourages social interaction with peers. She also gets to ride the elevator at school. ;-) I really am trying to see the positive in this. It happened, let's deal with it and make it work. I made this card for the latest challenge at Sentimental Sundays which is black, white, and one more color. I used a Bugaboo image who is are sponsor this week. I popped up his 'stache with foam dots and gave him a light coloring of pearl white from Copic. That's a SRM sticker for the sentiment The gingham print paper is from Lily Bee. I love this paper so! I am down to a tiny scrap. I wrapped a piece of pink twine and made a bow to complete. I hope you will join us for this week's challenge! :( So sorry she got her ankle hurt... I loveeeeeeee your card!! Loving the colors and the stitching!!!! So sorry about your daughter's ankle. Your card is very cute! oh dear that looks painful.. Hope it heals soon. This dog is truly cute! I like the clean and simple touch of the card and the pink colour, thanks for joining in our challenge at Crafty Ribbons this fortnight! I am so very sorry to hear about your daughter's sprain!!! I pray she heals really quickly!!! What a cute card. So gorgeous design. I like the softness of colors and that dog is so cute. I appreciate your work. Thanks for sharing. Cute card and hugs and kisses to your daughter! Hope she heals quickly! What a CUTE card! My prayers are with your daughter that her ankle recovers quickly...poor thing! HUGS! Your poor Daughter. That looks so painful. You know I have heard that a sprain hurts worst than a break. I love how you can make the best of a situation like this. Your card is just as cute as can be..
Big Hugs to you my friend. Sorry to hear of your daughter's sprain. That looks painful! Big hug! Sorry to hear about your daughter, hope she heals up fast. Love your card and love how you did the adorable dog too! Awww what a cutie! Fabulous card. Thanks for joining us at Crafty Ribbons this time.